The Bank of England’s latest Inflation Report is just out: it’s the quarterly summary used to sum up the Bank’s outlook, and offers some juicy hints about when the Bank of England will hike rates after nearly six years. The overall message is that it looks like rates will rise later and more slowly, and the Bank doesn’t seem unhappy about that. Inflation’s expected to stay below 2% for three years but the extra stimulus of low rates means growth should be pretty decent. Inflation is forecast to drop to just 1.1% in the first quarter of next year. It’s not expected to go back to target for three years. Unemployment to fall to 5.5% by the middle of 2015. Growth forecasts are stronger than expected: the Bank says GDP will rise 3.4% this year, 2.7% next year and 2.6% in 2016. Analysts were expecting forecasts to be a bit more modest this time. But world growth is crumbling: the Bank now says it will be 0.25 percentage points lower this year than they expected previously, and 0.5 points lower than they thought next year. As a result, market expectations for the first rate hike are significantly down from where they were three months ago: investors now expect the bank’s benchmark interest rate to rise to just 1% by the start of 2016, as opposed to the 1.5% they expected before. Markets expected the first rate hike in February 2015 three months ago. That’s now shifted all the way to October, and the Bank seems pretty content with that. Governor Mark Carney is speaking live at a press conference now. Inflation is “more likely than not” to float below 1%, just half of the Bank’s target, early next year. 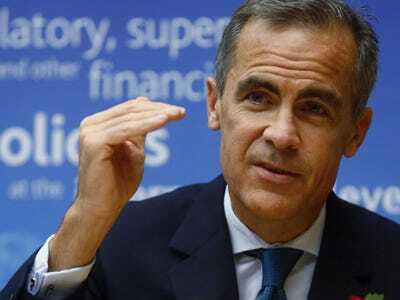 Bank of England governor Mark Carney would then have to write a letter to chancellor George Osborne explaining why inflation came so far off target. The Bank’s noting that though strong growth is expected, “pessimism about the global economy has increased” and the situation in the euro area is looking pretty bleak. The report goes on to say that the growth outlook for Europe has worsened, with “the factors depressing growth likely to outweigh the potential positive impact of ECB policy action.” The Bank expected 1% growth this year and 1.75% growth next year for the currency union, but it now expects just 0.75% and 1.25%. The basic message here is that raising rates is going to have to wait, but that growth won’t actually be much changed for the UK: those extra months and potentially years of low rates should keep the UK economy expanding at a pretty healthy pace. They’re still expecting unemployment to drop, productivity to bounce back and business investment to be pretty strong in the years ahead.